Every breath we take connects us to the whole biosphere. It's both fact and metaphor that tiny atoms of carbon, oxygen and other elements flow from our lungs, out into the world, and back again. These atoms become part of clouds, other creatures, plants; they ride the wind. One of the most remarkable turnstiles for these elements are stomata, a pair of cells which form an opening on plant leaves, stems and flowers. Stomata draw in carbon dioxide from our breaths and other sources, and release water and oxygen in the service of plant growth and survival for all living things. 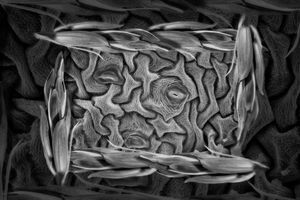 Stomata show up in a stunning range of shapes, textures and designs. They are humble, beautiful, exceptionally important structures worthy of celebration. 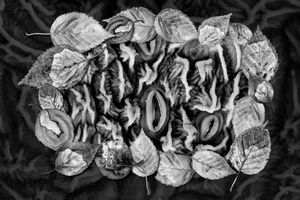 This work celebrates intricate textures and microscopic details of leaves. 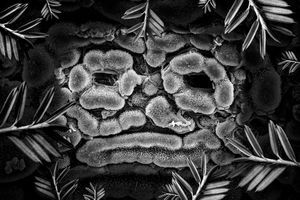 To reveal the marvels of stomata, as described above, is reward enough. But I’d be lying if I didn’t express depths beyond the wonder that this work holds for me. A composition is a stage, canvas, novel and song, where drama, conflict, tension, metaphor, epiphany, tone, relationship, and psyche play out. 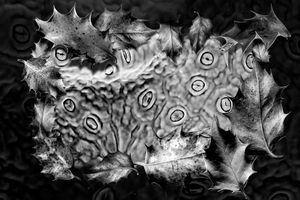 Shadows, curves, orifices, spikes, flakes, wisps and convolutions suggest this daily life drama revealed, like a Tarot card, but in the minuscule. 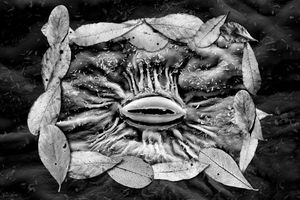 Our breaths, the rhythms of our heart, the patterns and textures of thought paired with dreams and struggles, are themselves micro-landscapes, with corollary expression in natural forms. 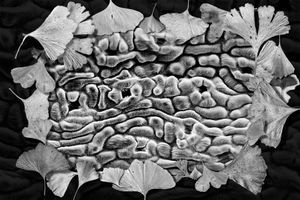 Rather than turning to tea leaves for divination, this work turns to the surfaces and stomata of many different leaves. Go here for inspiration from nature’s wonders, or for the reflection and contemplation they evoke. Note: Most of these images are best viewed at 45" wide by 30" high. 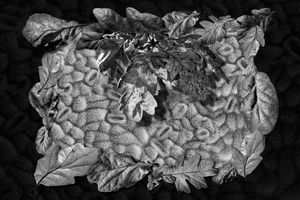 They are photomontages combining both scanning electron micrographs and macro photography of leaves found near my home. 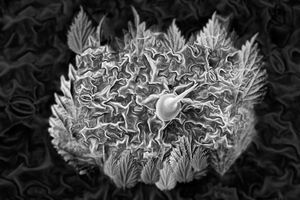 I've been fascinated by micro worlds since I was a child, and this work has brought me closer than ever to those mysteries; the stomata in this series are all roughly one hundredth the width of a pinhead in scale. That these cells, as small as they are, help drive the climate of the planet--this blows my mind.